MEOC, as a TRIO program, is part of a larger family of similar programs. The Council for Opportunity in Education (COE) is the national association of TRIO programs. Recently, they introduced a new feature on their website that will highlight notable alums from programs similar to MEOC. This first post highlights actress Viola Davis, who is an alumna from the Upward Bound program at Rhode Island College. 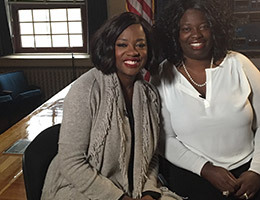 When internationally-acclaimed actress Viola Davis gains her star on the Hollywood Walk of Fame Jan. 5, two special people will be among the many around the world cheering her on: Her older sister, Deloris Grant, and the sisters’ earliest acting coach, Ron Stetson.The federal Upward Bound program links all three. As teenagers, Deloris and Viola in 1979 enrolled together in the six-week intensive Upward Bound program at Rhode Island College. They did so during the one and only summer that Stetson worked in the college prep, student success program for those who are low-income or “first generation,” meaning their parents did not obtain a college degree. Get more out of a college visit. Asking the best questions may get your the best information for deciding on a school. You can’t always go just on that first impression of a campus. Dig deeper to unearth more about the campus, students, faculty, academics, extra curriculars, and more. Educational Talent Search students! If you registered for an ACT with a fee waiver, you get free access to Kaplan test prep. Log into your ACT account and check it out.